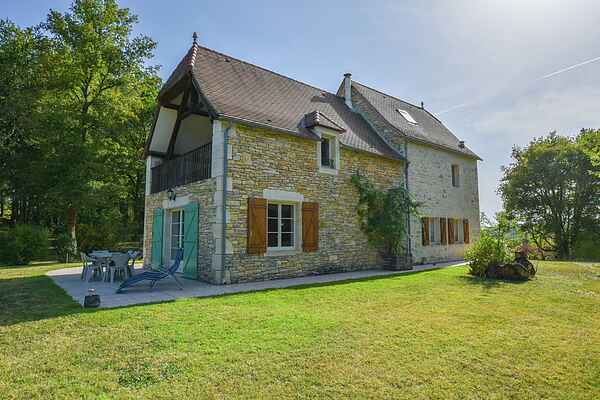 This holiday home is in a perfect location in the wonderful Lot region, adjoining the Dordogne and Lot-et-Garonne departments. A vast plot of private land surrounds the house. From the garden, you can admire the view of the village of Les Arques and the Pechaurié Castle. In addition to a well-positioned lawn, you will have the use of a bowling green. Near the house is a very sunny terrace with garden furniture and a barbecue to position according to your preference and the sunshine: have breakfast at the back of the house, dinner on the side terrace or an aperitif on the other side of the house, in front of a sunset. The richly wooded, gently sloping landscape perfectly lends itself to great walks or bike rides. Four bikes are provided for your use! In Cazals (6km), you will find a lake with a beach. A local market is also organised there every Sunday morning. For good wine lovers, the Cahors vineyard awaits about twenty kilometres away. If you are interested in art, visit the village of Les Arques where you will find the Zadkine Museum, which pays homage to the Russian sculptor of the same name. For more activity, you can visit the charming town of Cahors (27km) known for its convent as well as the impressive Valentrée bridge that spans the river Lot. Do not miss Rocamadour (56km), a cliffside village, typical of the department, and a centuries-old pilgrimage shrine. In the area, you can also make a day trip to Saint Cirq Lapopie (60km), another village perched on a rocky promontory with an impressive view of the valley down below. The department is also filled with castles to visit such as the castles of Pechaurié (4km), Cazals (6km) or even Salviac (13km). You are not very far from the Dordogne either and especially the famous medieval city of Sarlat (44km).